When hurlers and Gaelic footballers describe their ultimate ambition, they often use a simple shorthand: ‘a Celtic cross’. Since the late-nineteenth century, the Gaelic Athletic Association has used a high cross for its logo and for All-Ireland medals. The modern use of the cross as a symbol of Irish achievement dates to at least the 1853 Irish Industrial Exhibition, in Dublin, which displayed high crosses as ‘fine monuments of the artistic skill and devoted piety of our Celtic ancestors’. The crosses are so deeply embedded in the Irish imagination that it seems almost sacrilegious to ask why they were made in the first place. 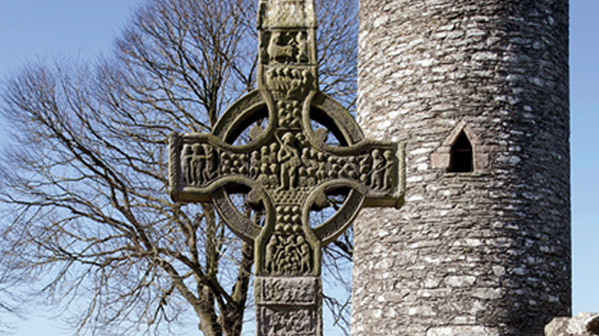 There was no native tradition of building in cut stone, so the appearance of high crosses in the eighth century was a major cultural innovation. So, as we have seen, was the idea of depicting, in a relatively realistic way, human subjects and stories. The crosses are not widely evident beyond Ireland and Irish-influenced Scotland. They required a huge investment of skill and resources and, as art historian Roger Stalley has put it, ‘it is hard to believe they were undertaken for purely altruistic or religious motives’. Yet they were erected on a very large scale: about 300 of them survive, of which 100 are decorated with carved images. The crosses undoubtedly served as gathering places for prayers for monks and pilgrims, but their scale and complexity far exceed this basic function. This cross, from Monasterboice in Co. Louth, is almost seven metres tall, and every available face is covered with elaborate carvings of a dazzling variety of scenes. The east face alone has Christ saving Peter from the water; Joshua; St Anthony tempted by demons; St Paul and St Anthony killing a devil; an angel shielding three children in the fiery furnace; and images of Elijah, Moses, Abraham and Isaac, David and Goliath, and David (again) killing a lion. Some crosses are inscribed with the names of kings or abbots, suggesting that they acted as potent symbols of the power and status of these dignitaries. Part of their function is to claim territory and mark boundaries. It is striking in this regard that the crosses are highly individual, with distinctive styles associated with different regions. The basic form is common to them all: a pyramidal base, a rectangular shaft culminating in a capstone and a large circle enclosing the arms of the cross. This circle may be intended to represent a halo around the figure of Christ, but it can also be seen as a cosmic symbol, in the manner of older Irish traditions of representations of the sun. One way of looking at the crosses is that they represent a new assertion of biblical Christianity in the face of a new pagan threat. By the time the cross-builders were at their most active, that threat was all too real.